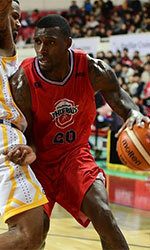 Mobis Phoebus defeated KCC Egis to take the lead in the series. Mobis Phoebus looked well-organized offensively handing out 25 assists. The former international forward Ricardo Ratliffe (203-89, college: Missouri) fired a double-double by scoring 30 points, 17 rebounds and 4 blocks for the winners. American guard Shannon Shorter (193-89, college: N.Texas) chipped in 13 points and 8 assists. Mobis Phoebus' coach Jae-Hak Yoo used a ten-player rotation which allowed the starters a little rest for the next games. American Brandon Brown (201-85, college: CS San Bernar.) 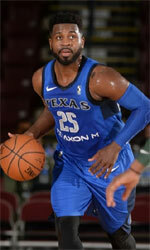 produced a double-double by scoring 32 points and 12 rebounds and the other American import point guard Marcus Keene (180-95, college: Cent Michigan, agency: Pensack Sports) added 15 points and 5 assists respectively for lost side. Five Mobis Phoebus and four KCC Egis players scored in double figures. ET Land beat LG Sakers in the opener. ET Land Elephants outrebounded LG Sakers 52-36 including 22 on the offensive glass. They looked well-organized offensively handing out 24 assists comparing to just 10 passes made by LG Sakers' players. American guard Giddy Potts (188-95, college: MTSU) fired 33 points (!!!) for the winners. International forward Hyo-Geun Jeong (200-93) chipped in a double-double by scoring 15 points, 10 rebounds and 4 assists. Four ET Land Elephants players scored in double figures. Central African-American power forward James Mays (205-86, college: Clemson) produced a double-double by scoring 31 points and 18 rebounds and the former international point guard Si-Rae Kim (179-89) added 17 points respectively for lost side. Both coaches used bench players which allowed the starters a little rest for the next games.